When my parents first took me to London we got the Bakerloo line from Paddington and as the tube train came thundering out of the tunnel I saw its name was ‘Elephant’. This I found perplexing and intriguing. Later my first Uni digs were in deepest suburban South London, a very long 68 bus ride from Swinging London. It dawdled along (what then seemed) the dowdy and desperately un-trendy Victorian and hidden Georgian parades of Camberwell Road and Walworth Road before swirling around the glitter of the new Elephant and Castle, but I never got off the bus there. I soon moved north of the river and South London remained an enigma for me, as it does for so many people. But Elephant and Castle today is hot property and here we can see in the starkest terms the consequences of 30 years of neo-liberal housing and planning dogma and of the globalisation of the London property market. 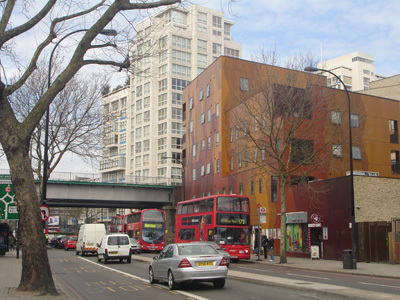 What makes Elephant and Castle hot property is proximity to central London and a large supply of publically owned housing which can be flogged off cheaply for redevelopment. Your mental map puts Elephant somewhere in the Dakotas but actually it is as close to Westminster as Aldwych, no further from Bank than the Magic Roundabout and as near to Piccadilly Circus as is King’s Cross. And unlike the rest of South London it is very well connected by tube with the Bakerloo and Northern lines and also Thameslink. From the elevated Thameslink station you get a great view of two projects which define the current failure of urban renewal: the soon to be demolished Heygate Estate and Strata. Elephant and Castle does not have the dense urban texture of Bankside and Borough nor their Ackroyd-like historical interest. Enfolded in the bend of the Thames it is one of the hubs of the confusing roads mostly laid out in the early C19th which lead to Westminster, Waterloo, Blackfriars, Southwark and London bridges. The careless jumble where six arterial roads came together at the eponymous pub was swept away in the 1950s by over enthusiastic traffic engineers to make way for a much hated mega roundabout and subway system, leaving only tiny fragments of the cosy old Elephant. The masterplan for redevelopment included a new shopping centre and a cluster of office towers but the results were a disappointment. The tower above the shopping centre is characterised by Bridget Cherry as ‘early depressing examples of the species’. North of the roundabout is Goldfinger’s Alexander Fleming House of 1959, a very austere, even intimidating, group of concrete office towers now converted to flats. The gap between aspiration and outcomes is similar to Croydon if on a smaller scale. 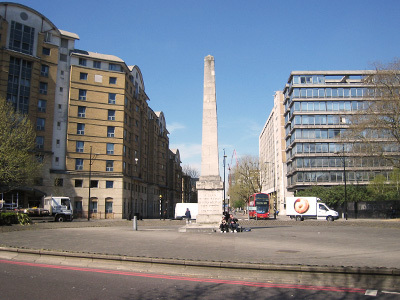 South Bank University occupies a large triangle north from the roundabout towards Borough Road but has little relationship with Elephant and not much coherence as a university campus. It is really very dull, injecting little vitality into the architecture, townscape or street life of the area. Indeed buildings like McLaran House facing St George’s Circus are so gross as to crush any prospect of life out of the place. The circus was intended as a delicate rond-point and does have a certain Parisian feel, a few students sitting in the sun next to an obelisk in its centre. And not all the buildings are bad. Erlang House is a simple 70s office block but has some elegance and is now a gallery and artists studios, that is until it is knocked down for 400 Barratt flats. On the corner of Waterloo Road is the much praised new H10 hotel by Maccrenor Lavington; spare, well considered, well proportioned, well executed, its virtue is exactly that it does not set out to be an icon. The streets radiating towards the bridges from the hubs of Elephant and St George’s Circus are quite grand and tree lined with handsome terraces surviving in places amid a heterodoxy of social housing developments. But traffic races in platoons along unnecessary one way systems which is one reason why street life is largely noticeable by its absence. St George’s Road leading west from Elephant shows something of an eclectic mix of Georgian and high Victorian with quite grand houses cheek by jowl with tenements. The side streets still look like a black and white photograph from Nairn’s London. Towards Kennington Road there are very des res streets like West Square and Walcot Square with its wonderfully ascetic 2 storey (with basement) Georgian terraces, which look like the inspiration for so many architects re-interpreting the terrace tradition today. 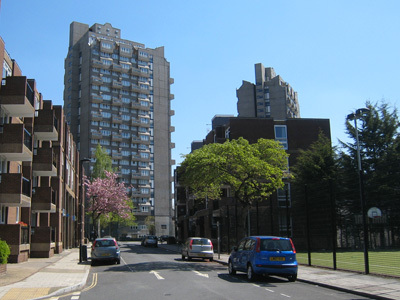 It is worth a detour south to Kennington Lane in order to see the extraordinary Cotton Gardens estate, which from a distance looks like tower-houses on concrete steroids. Close to the buildings are well detailed and articulated. 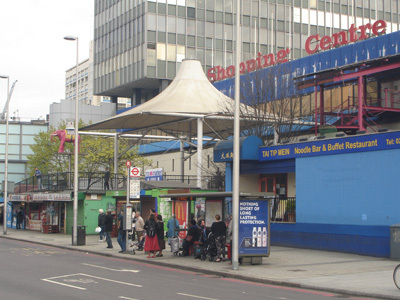 At the heart of Elephant and Castle is the now run down and shabby 60s shopping centre, reminiscent of the exorcised Bull Ring in Brum. It sits tentatively next to a swirling cauldron of roads, all difficult levels, subways, jolly crowded markets, quite exciting but very confusing. It was never a looker but successive attempts to jazz it up have obscured a certain elegant sparsity of the original design and just made it look tatty. 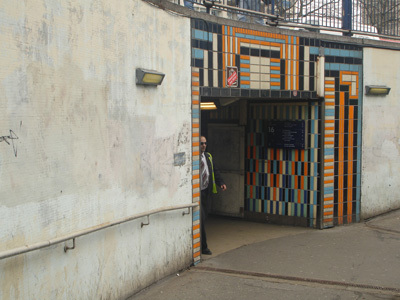 However the decoration and murals of the labyrinthine subways dating from the early 90s are rather fine, including not only Cockney nostalgia but exotic jungle scenes. Of course the new orthodoxy is that all this should be swept away and replaced with new vibrant open shopping streets and boulevards with subdued traffic and wide pedestrian crossings. The present centre is distinctly short of places to sit and sip cappuccino. However plans for radical redevelopment seem to have been shelved ’cos of the recession, and a make over of the existing complex is now on the cards. Certainly the malls look drab but with new shop fronts and lighting what’s the fundamental difference from Olympic Westfield? 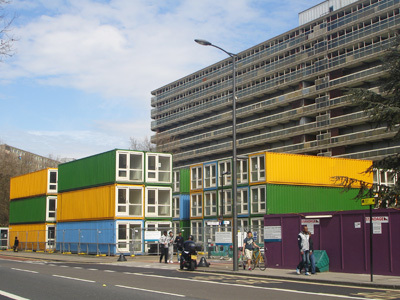 Well size obviously and tenant mix – the centre clearly does not cater for the sort of resident to which Southwark’s housing and planning policy aspires. Gentrification is applied to shopping centres as much as housing estates. Meanwhile Boris Johnson still wants the notorious roundabout converted into a pedestrian-friendly peninsula. Witherford Watson Mann has been asked in a rather florid way to ‘show how these proposals will enhance the area (and) help to deliver transformational change from transport-dominated space to a delightful place, cherished by locals, regulars, and occasional visitors alike.’ This must mean reducing traffic volumes which are very high, partly because this is the perimeter of the congestion charging cordon, as at King’s Cross. Interestingly the idea of getting rid of the subways is being challenged by a sparky campaign to keep them. What this opposition really seems to illustrate is the deep seated distrust of residents for the way that Southwark and Boris are treating their area; people are fed up with having things done to them. However I can’t see how it can be a good idea to retain the present structures which impose such a tyranny on pedestrians and prevent the evolution of a more social space. The subways are really impossible to navigate and actually there are already tentative surface crossings, from which you can appreciate what a large area of roadspace can be released for public space. And what Elephant desperately needs is some space to breathe – at the moment it is all sound and fury. Perhaps more too can be made of the aluminum clad generating station in the middle of the roundabout, apparently a monument to Michael Faraday. ...or this? I'll go for the latter please. The Southwark Plan designates Elephant as ‘an Opportunity Area’ for large scale redevelopment and intensification, including 5,500 new homes and a big expansion of retail to make it a ‘town centre’. The policies supporting this are all very worthy, about mixed development, community, sustainability etc. etc. but the reality is rather different. In ‘The Lobby and the Failure of Democracy’ Anna Minton quotes Southwark’s former Director of Regeneration as follows: ‘Social housing generates people on low incomes and that generates poor school performance, middle class people stay away’. The plan is therefore for ‘managed but inclusive (sic) gentrification’. This goes to the heart of things. 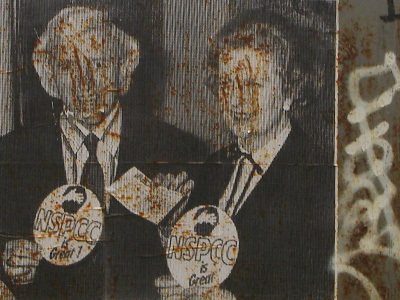 The late Mrs Thatcher will of course always be remembered for selling off council housing and pocketing the proceeds rather than re-investing them in housing, but the Blair policy of state sponsored gentrification is even more insidious because it was presented as community renewal whereas in fact its objective is the destruction of communities if they are working class. 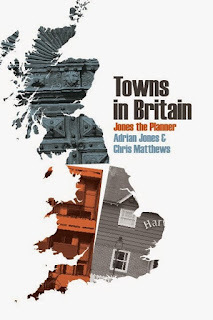 The urban design concepts of ‘Towards an Urban Renaissance’ as translated into planning policy pieties about mixed communities are hijacked in this cynical process, the consequences of which are now becoming fully apparent. Councils have been forced into the ideological disposal of housing in order to get funding for maintenance and improvements. ‘Partnership’ with big developers and construction firms becomes essential, the largesse of the HCA is conditional upon this overtly political policy. Some councils like Southwark embrace it enthusiastically, others reluctantly because it is the only game in town. Elephant and Castle shows this in the starkest way. In Bermondsey for example gentrification seems to be happening more subtly. Strata, which was intended to be a flagship for the new ’opportunity area’ actually illustrates much that went wrong with urban policy in Blairite Britain. It is that cheap looking tin cylinder of yuppie flats with those ridiculous wind turbines on top that insult your prospect of South London. 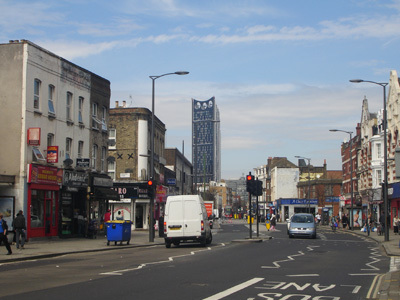 The worthy winner of the 2010 Carbuncle Cup, Ellis Woodman who led the judging panel said it was a damning indictment of town planning “quite simply the worst tall building ever constructed in London ….. 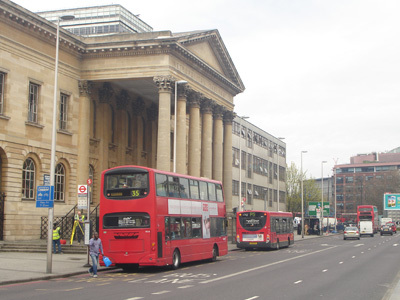 Councils are meant to protect us from these buildings. How on earth did it win approval? 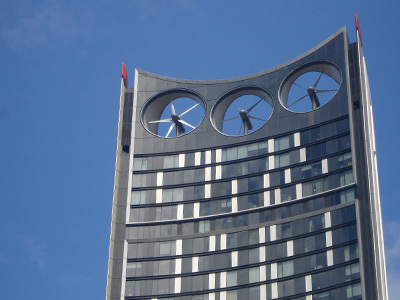 A skyscraper is an energy-greedy building form, both in terms of construction, and the power needed to take people to their front doors in a lift. To top one off with some wind turbines is the worst sort of greenwashing.” He concluded that the award was for “services to urban impropriety and breakfast-extracting ugliness”. How true, but Strata was not an aberration but the outcome of systematic political and planning objectives, as can be seen by the tragedy of the Heygate Estate, of which more later. 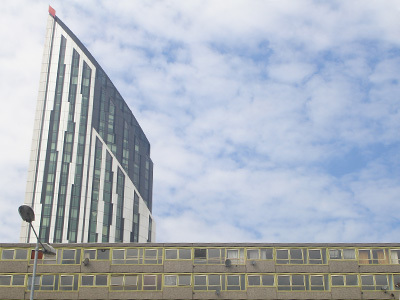 Strata does succeed through its sheer scale and ugliness in providing a marker for Elephant and Castle and also provides a grim forecast of what is to come. Across the road Lend Lease have just got planning permission for a 37-storey residential tower, the first phase of the regeneration ’partnership’. The sale of this land has apparently funded John McAslan’s £20 million leisure centre which will sit alongside. Meanwhile Stanton Williams has been commissioned to give the adjacent London College of Communications an £80 million revamp. However Allies & Morrison’s plans to replace a disused office block with 41 storeys of apartments have been famously thwarted for the time being at least by The Ministry of Sound and now squatters protesting at rip-off housing, gentrification and corporate profits. 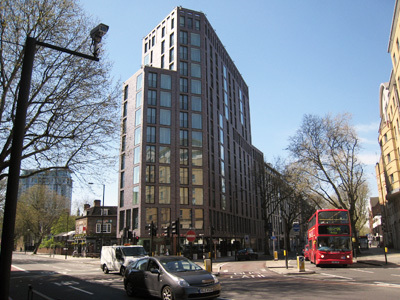 Developers Oakmayne are also having problems getting ‘Tribeca Square’ on New Kent Road underway. This planned cluster of towers ranging from 24 to 16 storeys is next to the Elephant Thameslink station and part of the Heygate masterplan. 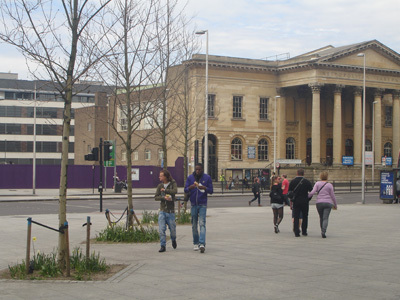 Allegedly ‘on site’ in 2011 there is nothing other than hoardings. Opposite this the striking Arch Street development by S333 provides a different and altogether more intelligent kind of brash. A relatively small housing scheme, as the BD review says, ‘with its shamelessly garish garb – as loud as the roar of the traffic along New Kent Road …. it is a startling sight that behaves more as billboard than building – strangely appropriate for the site. Veneered timber panels ascend the facade in shades of deep reddy-brown, graduating to lighter tints of yellow at the top, like flames licking up the side of the building.’ The architect comments that ‘we like to think of our facade as a piece of urban marquetry – something that gives the housing the luxurious appearance of a bespoke cabinet.’ Well, ok, that’s architect-speak for you but at least they are serious, not taking the piss like Strata and its ilk. The cause celebre of regeneration at Elephant is of course the Heygate estate right next to the Thameslink station. Designed by the Borough architects, the 1,100 flats were built in1970-4 in a series of massive slab blocks delicately thin when seen end on and forming an impressive townscape. Together with lower maisonettes these are linked by complicated but elegant walkways all set in a landscape of mature trees. It is not architecturally exceptional like say Robin Hood Gardens; in fact it is fairly typical of a genre of late post war inner city high rise council housing. These estates had helped solve the post war housing crisis but were swiftly overtaken by a political, economic and social revolution which was ideologically opposed to social housing. We have been conditioned over decades to see such estates as ‘concrete monstrosities’ and ’crime ridden ghettos’ which need to be swept away. 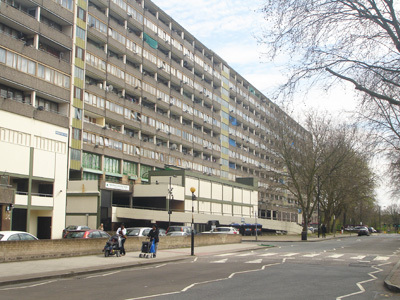 The Aylesbury Estate further south off Walworth Road is a classic example. 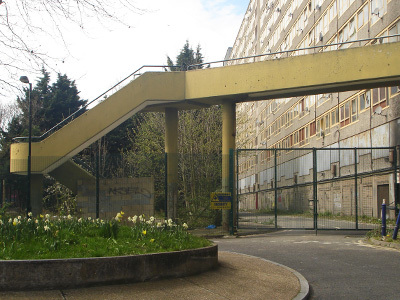 When built with its 2,700 flats for 10,000 residents it was the largest housing project in Europe, but even before it was completed in 1977 Oscar Newman toured the estate and pronounced ‘modern architecture actually encourages people to commit crime’. Well, that’s not borne out by the statistics for Aylesbury, which also happens to have high educational attainment. 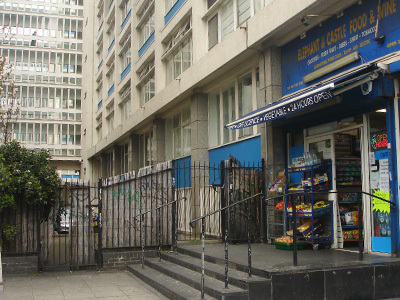 But the estate has became a symbol of perceived failure, and despite 73% of residents voting against demolition in 2001 a few years afterwards Southwark approved a plan for phased redevelopment. This follows the usual pattern seen in Hackney and elsewhere – double the density with over half the new homes being for sale. The scale of Aylesbury certainly comes as something of a shock, especially if you approach via modest terraces like Cadiz St and Liverpool Grove, the archetypal South London ‘little palaces’. Bridget Cherry says ‘an exploration can be recommended only for those who enjoy being stunned by the impersonal megalomaniac creations of the mid C20th’. What makes the estate difficult to understand or admire as architecture is that the blocks are so massive and uniform and pedestrian life has been so completely divorced from the streets which are given over to garages and servicing, slavishly following the paradigms of the day. Of course this is an outsider’s view and the estate could easily have been adapted and improved as the residents wished, but current political paradigms preclude this. 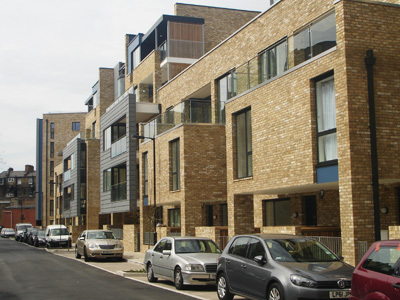 The first phase of re-development designed by Levitt Bernstein has recently been completed and won the London Planning Awards ‘Best Place to Live’ for 2012/13. Let us hope it is. By comparison with Aylesbury there is no case for equivocation about Heygate. 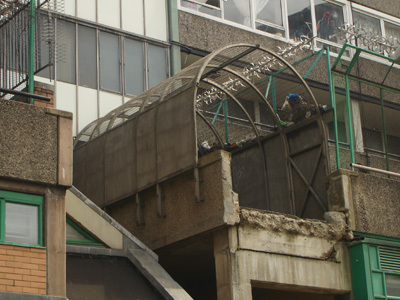 In 1998 Southwark commissioned a survey of Heygate which concluded that the buildings were in good condition, although in need of some maintenance. As with Aylesbury residents were generally happy with the estate and it was not a ghetto – crime levels were relatively low. Many people had strong connections with the area. 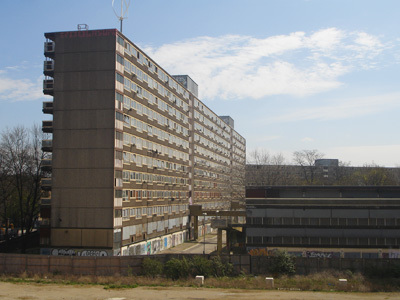 Nevertheless in 2002 the Council made the decision to demolish the estate and decant its 3,000 residents. In 2008 Lend Lease was appointed as lead developer. A masterplan by Make was adopted, paying lip service to all the Urban Renaissance nostrums. This includes 2,535 new flats of which only 79 would be social housing. Exploring the Heygate today, now uninhabited apart from one defiant resident, is desperately sad because it is so clearly an act of civic vandalism. As the C20th Society has said ‘there is no doubt the blocks could physically be refurbished. There are no major structural concerns, the concrete appears to be in excellent condition, increased insulation, new services, kitchens and bathrooms could be installed’ – all at modest cost. More housing could be built by demolishing garage blocks to provide a more conventional relationship with surrounding roads although arguments about lack of legibility and permeability are grossly overstated. 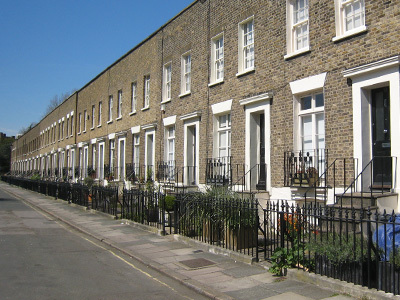 The estate has a clear structure with Heygate Street running through the middle and the layout is immediately apparent. The empty boarded up structures are covered with graffiti, much celebrating the fight against demolition, and it has an eerie beauty. There is a danger of being seduced by the tristesse of decay, like Dan Dubowitz’s anthology of dereliction. But the right response to what has happened is anger. The Make masterplan for redevelopment is what you would expect. 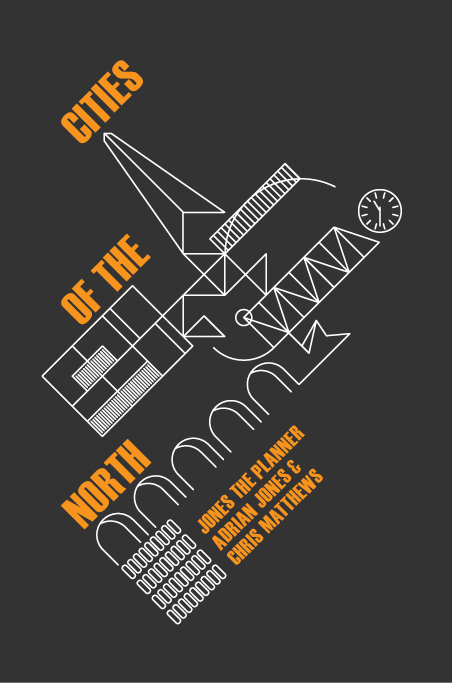 Its stated objectives are to ‘create a thriving and sustainable urban quarter …. a network of quality spaces …. deliver quality architectural design and distinctiveness using a variety of architects’, amongst many other good intentions. 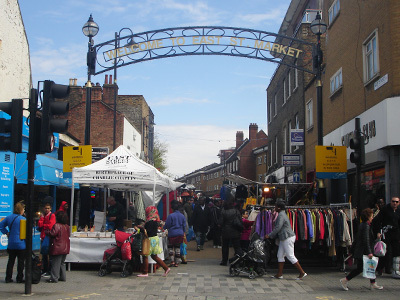 Key components are new shopping parades to connect Elephant to Walworth Road. This is an old fashioned shopping street teeming with life, with the fabulous East St market further south. There is a civic group of buildings here, the old Town Hall, Library and Cuming Museum together with a 1930s health centre. 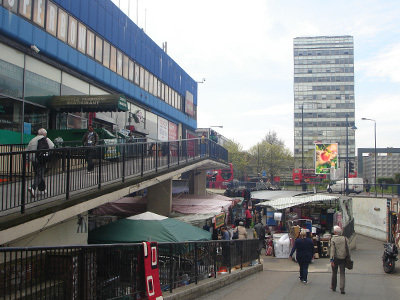 The plan is to create a new shopping street linking this to a new open market next to the Thameslink station. Much is also made of a new park as a central axis, although this is not as grand as it sounds, being scarcely larger than the nearby Victory Community Park. The height and massing plan shows how such a large quantum of development will be fitted onto a 9 hectare site – big blocks and taller towers. ‘Two buildings of 37 and 27 storeys create a visual termination to strategic routes and create a complementary cluster of taller buildings towards the centre …. a 25 storey block frames the park and provides a visual focus along local view corridors.’ Walworth Road and New Kent Road will be lined with towers with large retail units underneath. It is a familiar package of property greed passed off as urban design. What is noteworthy is the way that environmental determinist dogmas are so confidently asserted as revealed truth by government, their agencies, councils, developers, architects and planners in order to justify public interventions and public funding which ends up marginalising the poorest and creating even more inequality in a dangerously unequal city. The post war modernists who built the estate too had their certainties, at times misplaced, but their ethos and objectives were at least laudable. Some of the new architecture may indeed be good and the first phase of Aylesbury is at least promising. 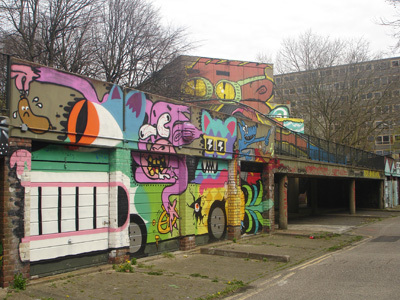 London’s cosmopolitan vitality could embrace the new ‘streets’ of Heygate and you certainly need somewhere you can get a decent cup of coffee. But what sort of London are we really creating, and why? Last year the number of social housing starts in London fell to just 1,672, an astonishing indictment of 30 years of reckless ignorance and indifference about real housing need. Meanwhile flats in the new Heygate are being advertised in the Gulf states. This is the true nature of the housing scandal which all the guff about regeneration serves to obfuscate. It is certainly not something architects and planners can be proud of being complicit in. "The cynicism, stupidity, short sightedness, incompetence and desperation of housing and planning policy could not be clearer." A lot of what you say is right and is well put. But there is also a lot of inaccuracy here where I feel that the 'good story' and the hyperbole has got in the way of the truth (which is more nuanced). If I have time later I'll go into more detail. For clarity, I'm not involved in the E&C regen. I did live on Walworth Road for 9 years quite recently. "Across the road Lend Lease have just got planning permission for a 37-storey residential tower, the first phase of the regeneration ’partnership’. The sale of this land has apparently funded John McAslan’s £20 million leisure centre which will sit alongside." The new leisure centre will be around half the size of the demolished one, which was estimated to have only cost £8m to have been refurbished. What a thorough article, a great read. I've posted links to it in a few places online so more people get to take this all in. As one of the campaigners to improve not destroy the subways I would appeal for your support based on the usefulness and value of the space underground. The current signage is terrible, the need for subterranean passages unfortunate given the priority given to traffic, but why destroy precious space altogether. At the very least, if traffic volumes are reduced and sharing surface level more practical than recent proposals, the subways should surely be fund a different use not filled in. Like concrete mid century estates that we have been conditioned to despise subways. As you show in detail, they're not all bad. At the Elephant one example of early 1970s high rise social housing the council are thankfully not demolishing that was given a £1m refurbishment 2 years ago (by leaseholders and the council) and has a very stable socialable community investing in the future here is Perronet House (www.perronethouse.com). This year we open for Open Cities in September so people can discover what lies beyond the concrete exterior - the majority of residents in the 90 flats are still council tenants. In 1970 the design was awarded a commendation by the government's Good Design In Housing Awards. We are the remains of what could have been for places like the Heygate had they not been put on death row. And with shiny new blocks rising around us, we're an increasingly rare visible reminder of the previous vision for the area. Thank you for a terrific post. Current thinking is to give the pedestrian priority over the car and so subways and footbridges go. The 1960s approach of giving traffic priority led to multi-level streets like London Wall (as was) and subways are part of that approach. How much better to keep pedestrians as part of the street scene rather than send them underground just to cross the road. All good stuff, but the word is "publicly", not "publically". Great post i really enjoyed reading it. In my work I have been in lots of flats on the Aylesbury estate and despite many tenants living there for many years and raising families all I've spoken to say they would like to see it redeveloped. I think you maybe right about high educational achievement as many parents I have met on the estate have children at university or who are now professionals. However I spoke to a mother only today who had lived there for 19 years and said it is not safe and her son has been mugged twice in last two years. There have been two murders off Thurlow Road in last year and last year a young boy fell to his death opening his bedroom window in one block. I think the best thing is for it to come down. Check out the amount of bin stores that have been set on fire. I'd be terrified living in a flat with the bin stores on the walkway right outside the front door. Have the bling bloated London elites and city burghers learned nuffink from them riots what went down two years ago? Why is there such a rocket fuelled race towards greater inequality in a city already scarred with a rich/poor divide? Living in a city ( Glasgow ) where vast amounts of High Risers are being demolished- its generally agreed that they are of poor standard AND do little to facilitate a sense of community- it does seem bizarre that we see the embracing of such a model in London. As you say in your blog: THIS IS ALL ABOUT MAXIMISING PROFIT and nothing to do with Boris' lip service to 'regeneration' and solutions to the housing crisis. What I find so amazing about market fundamentalism-profit for profits sake-kleptocratic elitism and all that jazz is after a generation of abject failure and one catastrophe after another is it still held up as culturally orthodoxy? Will we only wake up as a nation when they are literally tearing the shirts off our backs? No mention of the Coronet Theatre, still miraculously functioning but under threat by the grasping regeneration. At 28 New Kent Road, in the heart of the site, originally built in 1872, it burnt down as theatres were prone to do in the era of lime lights. It was rebuilt by the major theatre architect, Frank Matcham and became the Elephant and Castle Theatre in 1879. It has hosted all manner of significant acts, including the young Charlie Chaplin (whose mother spent time in the nearby old Lambeth workhouse in Renfrew Road whose Master's House now houses the Cinema Museum) and, rather later, Bill Haley. Now the philistines have it in their sights.